A well evolved aged Raw Puerh Tea which is very mellow and perfect for someone just starting out with raw pu-erh, to get an idea of the flavour and taste. This is a unique raw pu-erh cake. The fresh leaves are from Fengqing large leaf species in Yunnan. 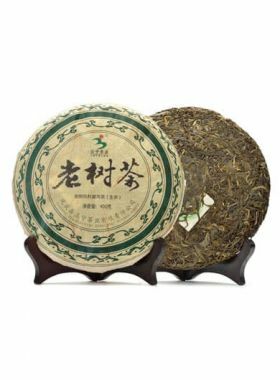 This wild tree Raw Puerh Tea has powerful flavor and soft aftertaste. When sipping it, the fragrance and taste linger on your tongue, bringing the sweetness to your throat. There’re fifteen towns and villages in Fengqing that are covered with wild and cultivated old tea trees. Puerh tea areas includ Xiang Zhu in Xiaowan Town, Xinyuan, Dashi Village, Mengyou Village, Yongxin, and so on, totally around 31000 mu. 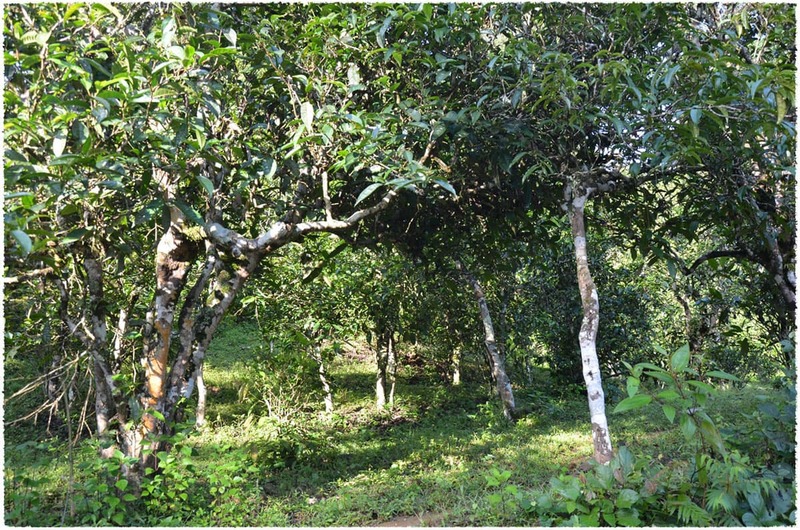 The region of Mengyou area in Yunnan is a prominent place with wild tea trees, half wild and half cultivated tea trees. There’re lots of old tea trees that are aged to a few hundred years and some are even up to a thousand years old or more. The Ancient Tea Plantations here in Mengyou is a special cultural landscape, which gives vitality to this place. Alihou Village is located in the south of Mengyou and is about 20 kilometers to the government of Mengyou Town and about 60 kilometers to the downtown of Fengqing County. The surface of the road to the town is stone and soil, so the traffic of this area is not convenient. The whole village covers about 20.6 square kilometers. This village belongs to Mengyou Town, Fengqing County, Lincang City, Yunnan Province. The altitude of this village is 1,870 meters. The average temperature here is about 16℃. The annual precipitation is about 1,300 millimeters. This Pu-erh Cake is from the representative Pu-erh production area Fengqing which is located in the south of Dianxi Longitudinal Valley. 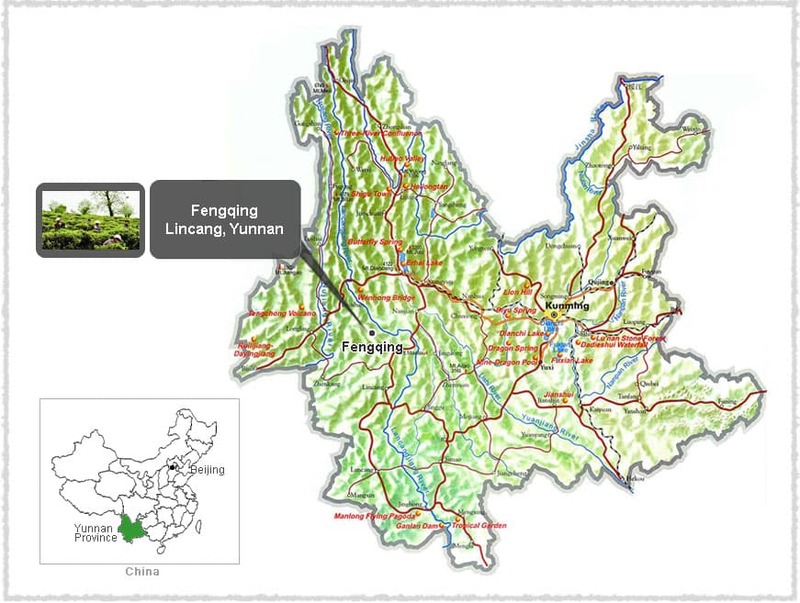 Fengqing is a county locates in the northwest of Lincang, one of the four famous Pu-erh production areas (Xishuangbanna, Pu’er, Lincang and Baoshan), and is one of the first origin places of tea in the world. It is also famous for being the hometown of Yunnan black tea in Lincang. Fengqing has a long history of planting, producing and drinking tea and it contains a throng of mountains alternated with rivers. 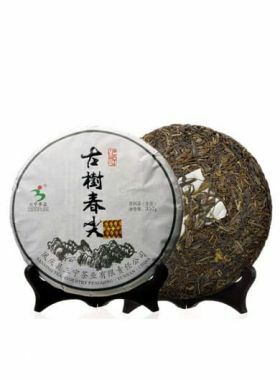 This Puerh Tea is made from Fengqing large-leaf species that belong to Yunnan large-leaf species. The sexual propagation, arbour, super large-leaf means this big plant can reach over 6 meters tall. 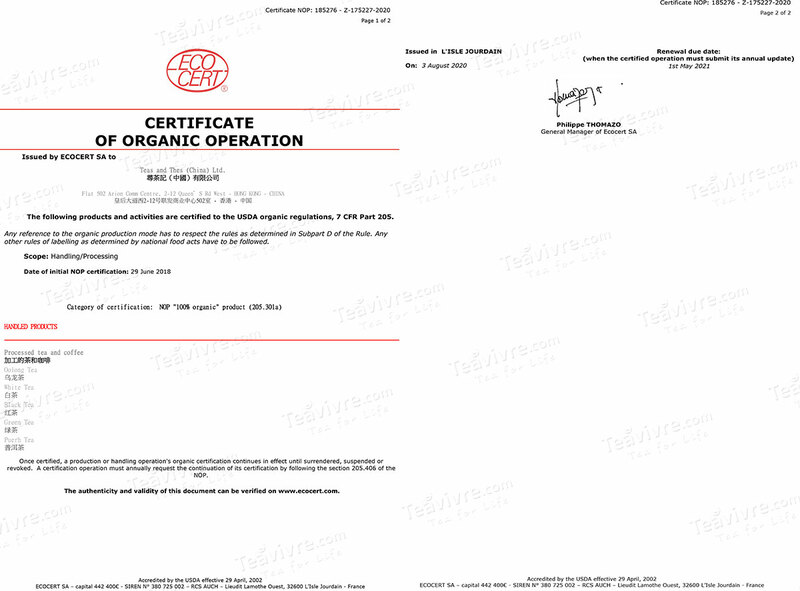 In 1984 the Fengqing large-leaf species was certified by the Chinese Government as national grade and was numbered as “Huacha NO. 13 (GsCT13)”. 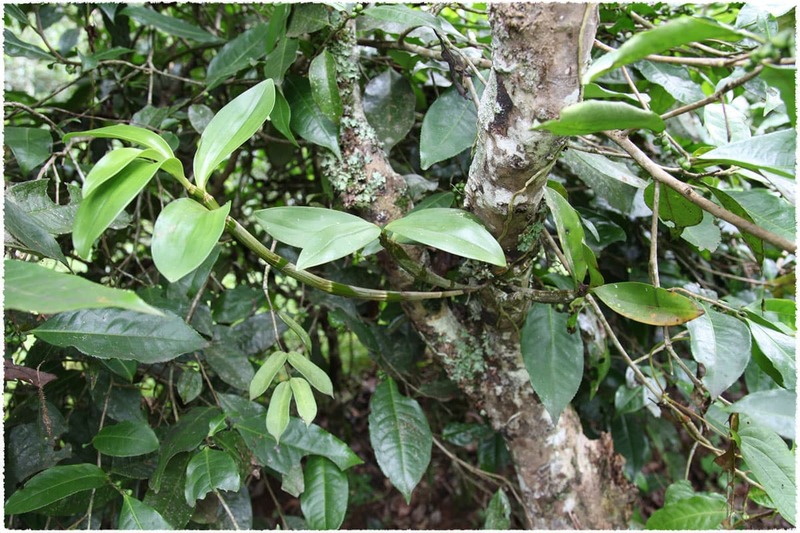 This species contains an abundant amount of tea polyphenol and catechin. The formation of these teas in the spring is 2.9% amino acid, 30.2% tea polyphenol, 3.2% caffeine and 13.4% catechin. Pu'erh tea is one of the oldest types of tea in China, with a history stretching back over 1,700 years to the Eastern Han Dynasty, when the tea was called Jing Cha. Pu'erh is named after the town of Pu-erh in Yunnan province, which was the early trading center for this tea. In this teas early history it was used as a bartering currency in south west China. In south west China the famed Cha Ma Gu Dao - “Tea Horse Road” - was built especially to transport this tea through the Himalayas to other countries and areas in Tibet.